There’s a myth going around that DSLRs shoot great video footage. They don’t. They are not video cameras and as such, usually result in sub-par video. If you want to shoot video, go buy a video camera. Stop listening to the cool kids telling you to shoot video on your non-video camera DSLR. For the types of stuff most people are shooting on DSLRs, a sub-$2000 video camera, like the Canon XA10, will probably serve them much better. Actually, $800 handhelds are often more than most people need. I’ve got a Panasonic that shoots absolutely beautiful HD. I know, I know… it’s not as cool, but for most things, even stuff that Pro Video guys shoot, you need to jump through hoops to get a DSLR to do what you want. For example, it’s doubtful I’d let someone with a DSLR rig shoot my wedding. IMHO it’s not the appropriate camera for the job. Most people using a DSLR to shoot a wedding are probably trying waaaay too hard to be a ‘filmmaker’ and probably not as focused on just shooting my wedding. Besides, I really don’t want someone wearing a rig that looks like an orthodontic headset for Frankenstein wandering around my wedding. Using a DSLR to shoot video is sometimes an endeavor worthy of Dr. Frankenstein. All that said… it is possible to get great footage out of a DSLR and you get to use all those super awesome lenses. The gist of this post is to get you thinking about the hype that surrounds DSLRs and video. The cameras have a LOT of shortcomings that most people are going to find difficult to workaround, even video pros that are used to higher end camcorders. Before you go running off trying to use a DSLR for video, consider what you’re shooting and what you want to achieve. Examine the features that DSLRs are lacking, how that will affect what you’re shooting, and what you will have to buy to compensate for the missing video features. Use that as a guide to determine whether you should spend the time and money on outfitting your DSLR to shoot video or just buying a video camera that’s designed for video from the ground up. Hi Jim, is your email account working now?? After I send email to these email I got “failure notice”. Both of those accounts are working. You can also send it to anarchyjim@nullgmail.com. Can you send me the failure notice? We’re definitely receiving lots of email on both accounts, so not sure what issue you could be running into. I am a DSLR video instructor at Bay Area Video Coalition, the nation’s largest nonprofit media education center. While I agree with many of your points, I can’t help but feel like you’re a little off mark here. The star feature of DSLR shooting is 35mm-like selective focus which you simply can’t get from a Canon XA, XF, Panasonic or any other small-sensor camera. Say what you will about the current over zealous application of rack focuses in vogue at the moment, but shallow depth of field is a key cinematographic tool that had been unavailable to this price point until video-enabled DSLRs, and the quality of low budget work has vastly improved as a result, at least in the hands of capable operators willing to deal with the many workarounds necessary for good audio, etc… Now that there are large-sensor video cameras which offer similar DOF properties on a real video camera, many at the middle segment of the market can graduate to them-but as yet, they still aren’t as cheap as a DSLR. I warn my students that they will hear pro DPs complain about some penny-pinching producer who wants to shoot a multimillion dollar feature on a 5D instead of an Alexa. Yes, there are very good reasons why for many applications, this wouldn’t be the right tool. Yet, on a project with a tight budget and big ambitions, or for DOF shallower than a super 35 camera (which the 5D has), or where being lightweight and inconspicuous is key, DSLRs are absolutely the right tool for the job. We are at a great time in the media world where there are so many good options to choose from, and excellent ways to bring high production value to the masses. The biggest problem is not bad cameras, but the difficulty of navigating which iteration of the hundreds of models is right for your project. We took the plunge, and got a Canon DSLR, just to see what the hype was about. We’d done a shoot with interns recently, using our HMC-150. One of our interns brought his Canon T2i, certainly on the lower end of the DSLR video spectrum. We were blown away by the quality and DOF, compared to our Panny. Hence, our purchase. However, now that I’ve had to re-learn everything that I’d long forgotten about SLR cameras, and even with the addition of the Magic Lantern firmware, which adds loads of video camera functionality to specific DSLR’s, I’m to the point that I’ll probably only use the Canon for shooting stock footage to sell. Most of our shooting in industrial, which requires our shooters to be up and running quickly, and not have to worry about setting up a rig, or getting into tight places with it. This would be a total hassle with a DSLR. Well, my intention was to spark some conversation and get people thinking about where DSLRs are useful and where they’re not. There’s a LOT of hype out there about these cameras and this post was more aimed at photographers thinking they should start shooting video because everyone is telling them how amazing their DSLR is for shooting video. I agree… if you’re shooting a film, the 5D is amazing. For Indie filmmakers it really is a godsend. However, if you’re a wedding photographer and want to shoot a little video on the side, or a corporate videographer trying to get stuff done on time/budget… they are considerably less amazing and you’re probably much better off with a solid pro video camera or, in the case of the photographer, even a $1000 handheld camcorder. So the post is intentionally skewed a bit towards the negative… but thank you for the filmmaker perspective on it! Thanks for sharing your experience. They do shoot beautiful footage when you have the time, knowledge, and equipment for it. It’s just that so often most of us don’t have all those three and there’s not a lot of discussion about the headaches involved with a DSLR when you don’t have those luxuries. I think they’re getting better about the overheating thing, but yeah, that’s another one of those ‘gotchas’. I’ve even heard a presentation by pro photographer (to other photographers) who dismissed this problem by saying ‘you shouldn’t be shooting long video. Most professional video folks do short takes of only a couple minutes anyways.’ lol.. I was like, what is this guy talking about? btw… big fan of BAVC (www.bavc.org/). Great facility you guys have there. And I agree, it’s a great time for producing media. Lots of camera options to choose from and lots of channels to broadcast on. I agree with Jim’s main idea here. DSLRS are a pain to get great video. If you are willing to put up with the limitations that DSLRs inherently have and are working with a small MONEY budget, but have a larger TIME budget, than they are worth it. They are best in a controlled environment with a full crew. That being said, I’ve shot a doc, run-and-gun style, with a DSLR and got some great footage, but I also lost a great footage because I wasn’t shooting with a real video camera. I have the XH1 and XA and use those to make money shooting corporate doc stuff, because I know I’ll get the shots I need, when I need them. As mentioned, I’m not really anti-DSLR. I think they’re great cameras that can get great footage in a variety of situations. I just don’t think there’s enough attention given to the limitations. The Blackmagic camera does look very interesting. As Chris mentioned, there’s a LOT of options out there for folks wanting to shoot video. I agree. The point of the post was that depending on their skill level and what they’re trying to shoot, many people aren’t going to get the quality you’re getting and, frankly, don’t _need_ that quality. So they’ll be better off with a true video camera. Is that true for everyone? Definitely not. The DSLRs are amazing cameras and there’s lots of folks doing great work with them. But it’s important to consider the limitations and how they relate to what you’re trying to shoot. We invested in a DSLR a few years ago and while they are fine for certain situations we kept a trusty Panasonic video camera for backup. I think once word gets out about this blog you’re going to be bombarded by the almost infinite number of wide open, grain obsessed, you can only edit on a Mac, steadicam techno-heads who spend more time discussing curves and noise than actually coming up with something worth shooting. But hey, some might say that I’m just bitter because I had to cut my teeth on VHS and two machine editing rather than having parents who feel it necessary to indulge in my film-making fantasies. One frame in the edit makes more difference that all the shallow depth of field in the world (I’m an editor, not a film-maker). Phew, glad that’s off my chest. If that all it takes these days to become a filmmaker is a DSLR and shallow DOF, then I’m in the wrong business. IFC Short Film of the Month Winner. I agree with your overall point. DSLR’s are not optimal for shooting video, and hopefully they are only a transitional product until high quality, large sensor video cameras with the benefits of DSLR’s minus their deficits become a more established market segment. I’ve been shooting for almost 30 years now. I started in film and went though all of the formats. It’s an awesome time to be in the business. I love my Panasonic P2 (HPX370). A few weeks ago I picked up a Canon DSLR just to play around with. It’s been fun. But to make it do what my P2 will do, I’d have to drop about three grand. It’s fun to play with. It reminds me of shooting film. I think of it as another tool for storytelling. Just like my GOPro. There are shooters doing good works. They would be doing great videos anyways with or without DLSR. I’ve shot wedding videos on HDV cameras for about 6 years and moved to filming on DSLR’s about 12 months ago. To be honest I hated the first 3 months. Focusing issues, sound issues etc. But once I got over the change in filming and went through the footage produced, I was simply blown away. There is just something beautiful about the look and feel of the clips that the 5D can produce. For me it’s brought life back into my work and I would never go back to filming on more traditional cameras. Also, I shoot a lot of Asian weddings with very little light. My 5D’s enable me to get into tight spaces and continue to amaze me every time. There are many great things about the 5D. But there are many caveats and in many situations you can get equally good footage out of traditional HD cameras. There are definitely times the 5D will let you get shots that would be impossible with other cameras. It’s just knowing the right tool for the job/shot. I think the DSLR revolution was great. I think it proved a point and it shifted how manufactures look at the end user. Please show me a beautiful wedding video shot with a camcorder. The only way to do it would be to have a tony of intrusive lights and total control of the environment, so you can isolate the subjects and eliminate distracting details, and this is just not practical at a wedding. Selective focus is more romantic ans it’s an important narrative device. Having everything in focus with the limited DR than a small sensor provides and your wedding will look like reality TV only much, much worse – limited potential to direct, light, reshoot. Small sensor camcorders are great when you want more DOF and you need long running times. Interviews, corporate work, sports, TV, etc. Weddings, nope! Yes, you’ll need 2 or more cameras for weddings. Yes, you need expensive equipment, nice lenses, external audio recorders, etc. 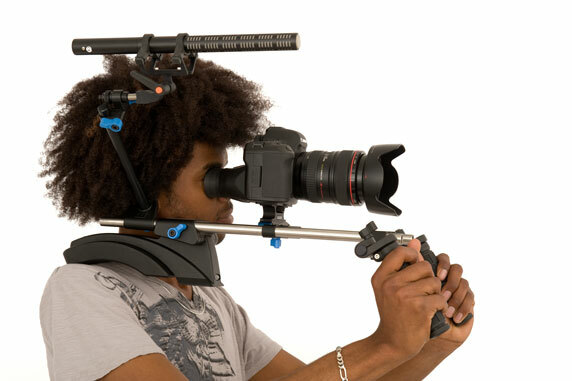 No, you would never use that silly shoulder rig (or any shoulder rig for that matter – monopods are where it’s at). But this is how you make a nice product that doesn’t look like it was shot in 1995. Based on where you were going with your article you are right on. Consumers who are interested in shooting family or travel videos should get a proper camcorder with good autofocus and stabilization. They’ll shoot and shoot, but will probably never watch the video again until they’ve discovered that their 120GB camcorder hard drive is full – and not backed up. We all know countless people that take picture after picture with their mobile phones and never print them or back them up. THIS is the same audience that should be buying a traditional camcorder (assuming they want to capture video). It’s easy and doesn’t get in their way. However, for your wedding, you would be crazy not to hire a skilled team that use DSLR’s or similar large sensor cameras to film it. The truth is that the filmmakers who care enough to actually learn how to properly shoot using DSLR’s and edit properly are the ones that actually CARE about telling the story of your wedding day – vs. just aiming the camera and documenting it. There are a growing number of excellent wedding filmmakers out there who understand the importance of great audio, lighting, composition, depth-of-field, and storytelling – and most use DSLR’s, C100/C300’s, etc. I have been filming weddings for almost 6 years and started with DSLR’s. I take pride in the films I create and also in the quality of the footage that the cameras I use, combined with my training and knowledge, can create. For me, it’s the RIGHT tool for weddings, which are often filmed in near darkness at receptions. However, I personally don’t care whether it’s a DSLR or a “proper” video camera. Right now it’s the best tool for the job. When it isn’t you can bet I’ll be upgrading my gear. This post (which is over a year old) was really aimed at the initial crop of DSLRs… 5Dm2s and the like. Photography cameras that had video as an after thought. I don’t consider C100/C300s, BMD Cinema Camera, etc. to be DSLRs. They’re actually designed to be video cameras, and they are beautiful video cameras. No argument there. And, yes, you can use 5Ds to get amazing footage, particularly if they’re locked down. But there’s many situations where I feel a 5D is limited and is not the right solution. Frankly, the post was a response to me being tired of hearing that the 5D was the be all, end all of video. I’m not seriously suggesting you use an $800 camcorder to shoot a wedding. btw… who linked to this post? It’s from last year and hasn’t had a comment in probably a year. Today there’s a deluge of them. In my opinion DSLRs are much more suited for filmmaking than camcorders because of the big sensor,DOF and prime lenses. Now i had a canon camcorder before i got a dslr and i knew nothing about ISO,shutter speed, iris or fps because everything is auto. Some exspensive camcorders do let you choose manuel but it is a pain to adjust and i rather ude some exstra money on extra gear than ude 10000$ on a broadcast camera than can’t even shoot in low light because the sensor is the size of a ant :) Also look at magic lantern making RAW video functions for Canons dslrs. If you want something comparable to a Red Scarlet a camcorder is the last thing i would choose. DSLR motion shooting provides a cinematic look not achievable with vid cams at a price affordable for creative film making souls. So this is really a non-issue. It’s a piece of gear, not a god. Like all equipment in the hands of the skilled it provides a desired result chosen by the artist, not the gear itself or the limited bias of a technition. I never wanted to use DSLRs due to the lack of button functions and awkward design. But now there are some interesting affordable high end camcorders with larger sensors, but also stocked with professional audio inputs and buttons. Take a look at the Sony PXW-X70 with a 1 inch 4K sensor. Small form factor with the whole package. I agree… DSLR is terrible for things moving around or run and gun, a cheap 300 dollar best buy cam and go pro captured better footage than my 2000 dollar dslr rig on a recent trip. Now if you are shooting a film, have lighting equipment, and know where everybody is going to be and in short clips…it’s great, and looks better. But for on the go spur of the moment stuff, filming in a restaurant, filming outdoors, family videos…dslr is crappo. I’m selling all my extras now and going back to a standalone camera plus video camcorder. What is bad? Focusing, audio, camera shake (even with a rode it’s ehhh), tracking, color isn’t as good either. I have been doing videography since the 90s…I wanted to use DSLR as a “one body” solution, but it just doesn’t work good enough for me, too many missed shots, out of focus, etc. i have a Nikon D750 and probably i will shoot utmost 72 hours in its life. – has this negative effect on sensor? i mean waken it or something like that? Well, first off, you can definitely shoot a movie with a DSLR. You just need to understand it’s limitations and that sometimes it’s not the right choice. But for some shots a dslr is beautiful and will give you the quality of a $100K video camera. Just understand the pros and cons of using it. All is needed to make a film is a good script. All this stuff of DSLR vs camcorders is nothing without a story to tell. Anyone these days, and I mean ANYONE, could film a great story even with an old VHS camcorder and take Hollywood by storm. Of course, DSLR have their pros and cons, as camcorders too. But if you have a good story to tell and know how to frame and how to edit and how to craft your movie… the last thing the audience will think of is the gear used for its shooting. I have a Canon Legria HF G25 that I love and a Canon EOS 600D that, yes, produces great footage, but there is something about my Legria that whispers my ears “choose me” everytime I think about shooting a new shortfilm or a feature film (as I did in seven days). I think for a no budget filmmaking situation a camcorder gets you covered in a way that DSLR can´t. Great article. I totally agree. In fact I love camcorders over DSLRs. Yes, I know DSLRs can take great footage, but I really think a good camcorder can do almost the same if the operator knows how to work with it. I chose a Canon Legria HF G25 camcorder to shoot a little no budget -and no crew- 64 minutes slasher movie in seven days. Can you make it in seven days with a DSLR? … ummm, I don’t think so. In fact I think if we could finish the shooting on a dead line was due to using a camcorder and not messing up with that DSLR thing. Camcorders give you freedom and leave you with no excuses to make your movie. It’s hilarious because you’re literally so wrong. I’ve learnt how to be a videographer on DSLR. They are extremely versatile cameras which can produce beautiful picture quality at a very low cost. I have used several professional and non professional ‘camcorders’ and they just do not compete in the slightest. I would rather use my old canon 700D than a £2000 camcorder. I learnt everything I know on them and it made it very easy to progress into a higher range of cameras (I now use arri alexas and red epics). so sir, you are wrong. Many of the pro-DSLR comments here are a prime (pun intended) example of “camera hipsters.” DSLRs are not camcorders and will never be camcorders. Sure, a Canon T3i can be bought used for $300 can shoot 1080p24 video using f/3.5 and “get that film look” that newbies and “style over substance” hipsters inexplicably lust for. Yes, your f/1.8 close-ups with your “nifty fifty” lens are so sharp that we can see your actor’s pores. Yes, you can get some really beautiful shots this way and DSLRs definitely fill in some important niches that used to only be available to those who could afford a cinema camcorder the price of a new sports car. That said, you’re not hip, trendy, cool, or even skilled just because you have a DSLR and shoot video with it. Your video does not magically look better because it was shot with a DSLR. Unless you spend a lot of money on expensive shoulder rigs, follow focuses, and similar add-ons, you’re pretty much stuck shooting carefully planned low-motion scenes on a tripod. Even then, your “gorgeous” shallow depth of field will easily ruin your shoot when you get back to the cutting room and realize that your subject moved an inch and dropped out of the narrow band where things stay in focus. It’s 2016 as of this comment and DSLR continuous auto-focus is still either non-existent or at least problematic. As long as you can work within the severe restrictions and can afford the accessories, it’s great, but it will never be a good substitute for a camcorder. Here’s the thing that aspiring filmmakers considering a DSLR should think about: an older video-capable DSLR will cost you about $300-$400 used while the newer models start around $650 and go way up from there. Instead of that, what if you got this: a $250 Canon R700 camcorder, a cheap $30 tripod (a Targus one from Walmart is fine), a few utility clamp lights (about $30 for 3 large ones) with “daylight” temperature CCFL 26W bulbs ($7), and a $40 powered shotgun mic (the Movo VXR40 on Amazon works great). That’s under $400 in equipment, the same cost as ONLY a used video DSLR, but you have a real camcorder that can do 1080p at 24p/30p/60p, a shotgun mic for much better audio, and some decent flexible lighting that can easily make your video look “pro.” Lighting and audio are the two huge things that make the difference between amateur and pro appearance, and all the DSLR awesomeness in the world won’t compensate for that. If you have $2500 to blow, why get a Panasonic GH4 or some other DSLR with all their limitations when you can get a Sony FDR-AX100 camcorder for $1700 (current retail) which has a large 1″ sensor, loads of manual controls, and records true 4K video at 24p/30p and spend the remaining $800 on lights, tripods, sliders, mics, props, a better computer, whatever! I apologize for the long-winded rant. I could go on and on about this subject but I’ve said my piece. I’d just like to see this DSLR video trend put to rest. Thanks for sparking the conversation. Totally agree. I think too many people take this DSRL vs camcorders subject as an excuse to avoid making actual movies. “I won’t make my masterpiece until having the best DSRL I can, or until having a RED or an EPIC” they say… But the point is tomorrow someone could upload in youtube a VHS shot movie and take Hollywood by storm and next week be in conversations with Spielberg. I mean, if a film is compelling and well done, thinking about the camera used to make it is pointless. LOL, well now I am like – what is this anarchyjim guy talking about. Very cool! Best to shot on a LEGRIA than on a DSLR. Are you serious? If you are unable to use it, it’s true. Shoot on Cellphones! But if you want to shoot a spot or a film (look how Michael Mann or Aronofsky use APSC DSLR) use a DSLR. If you have the budget shoot on Alexa or RED. Well, what I WAS talking about (the post is 4 years old) was mainly the hype around the 5D mark 2 (and still cameras generally), which was what most people were using. Pointing out that while they’re great for some things, they aren’t video cameras and had some serious shortcomings when shooting video. There’s still some truth to this for most photography-centric DSLRs, although they have improved a lot. And of course there are cameras like the C300, C500, etc. which are technically DSLRs but with features that are critical to someone shooting video, so as a consequence those are great for shooting video. Anyways, the main point was that still cameras can shoot amazing video, but be aware of their shortcomings for that type of shooting.